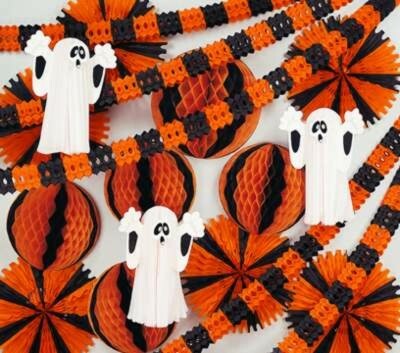 Spice up the fall with these frighteningly fun Halloween Decorating Kits. Colorful and festive, each Halloween Decorations Kit includes streamers, banners, spooky creature cut-outs, and much more. Halloween Decorating Kit - 1 19" Art-Tissue Ball, 2 14" Art-Tissue Balls, 1 18" Art-Tissue Spider, 1 44" Jointed Skeleton, 1 38" Jointed Scarecrow, 2 27" Jointed Ghosts, 2 28" Witch Cutouts, 4 16" Halloween Cutouts, 3 14" Nite-Glo Ghosts, 4 1' Arcade Garlands, and a 9' Fireproof Halloween Banner. Halloween Display Decorator Kit - 5 19" Art-Tissue Balls, 6 25" Art-Tissue Fans, 3 23" Hanging Ghosts, and 12 12' Arcade Garlands. 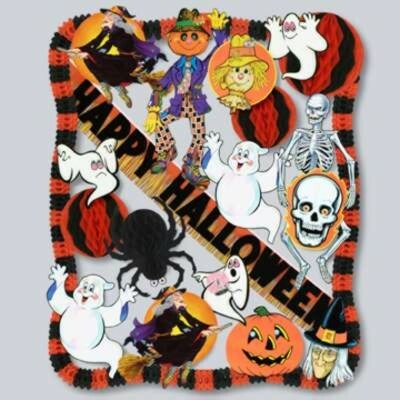 For additional information on any of our Halloween Decorating Kits, please contact us at 1-800-233-0828.